Is the iRex DR800SG a Kindle Killer? Watch out Amazon, there's a new ebook reader in the US with a built-in estore - the IRex Digital Reader 800SG. Announced today, the reader seems aimed directly at Amazon's Kindle, with a larger screen (8.1-inch compared to the Kindle's 6-inch), free 3G (EVDO) connectivity and $9.99 best-sellers from Barnes & Noble. The biggest design difference is the DR800SG comes with a touchscreen (and stylus) interface, instead of the Kindle's miniature Qwerty keyboard. The DR800SG supports multiple formats including the ePub format that is fast becoming the industry standard, with DRM protection. IRex is touting the reader as ideal for 'graphic rich' content like newspapers and magazines (available through its partnership with NewspaperDirect), with landscape as well as portrait orientation and adjustable font sizes. It has 2GB of memory. iRex's partnership with Barnes and Noble will give users access to more than 750,000 titles, and 3G downloads of books are claimed to take under a minute. Like Amazon, iRex does not charge extra for downloads, managed through Verizon Wireless, although the DR800SG does not have a built-in web browser. Kevin Hamilton, North American CEO of IRex Technologies said: "IRex has been a driving force behind the evolution of eReaders since its founders invented e-paper display technology based on E Ink Corporation's electronic ink. With the DR800SG, we bring to market all that readers have been asking for: a stellar device that puts the reader in the driver seat with regard to where they buy content and what they do with it." The DR800SG uses the multi-format Gobi communications module from Qualcomm that - unlike the Kindle - should enable it to download content in 3G (and legacy 2G) markets around the world. The Gobi module also includes a GPS receiver, although the iRex reader does not make use of it. The DR800SG will be available in US electronic chain Best Buy "later this autumn", with a European launch pencilled in for the first half of next year. It will cost $400 (£245), compared to the Kindle's $300 (£185) price-tag. 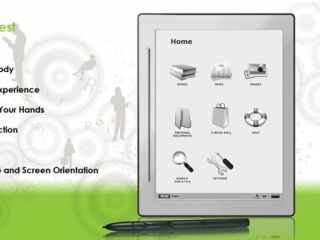 iRex is still promising to launch its first colour ebook reader in 2011.